Here is another great dish from our Mexican cooking club night. I loved this, but I love couscous. If you haven't tried couscous yet, I urge you to! I love it and so do my kids! This is a great mix of ingredients and the flavors are just perfect together. If you're gluten free, try quinoa instead of the couscous. I bet it would be out of this world good! I think I'll make some of that soon! Combine the couscous, cumin, and salt in a large bowl. Stir in the boiling water, cover and seal with plastic wrap. Set aside for 10 minutes. While the couscous is cooking, cook the unpeeled garlic clove in a small skillet over medium-high heat until toasted and the skin has turned golden-brown. Peel the garlic and mince. 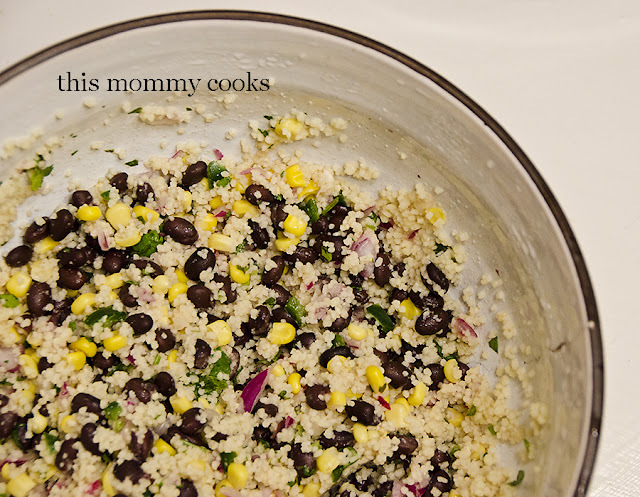 Stir the garlic into the couscous along with the black beans, corn, onion, cilantro, jalapeno pepper, olive oil, and lime juice. A Mexican cooking club sounds amazing! This dish looks simple and elegant.